is an attempt to fly around the world in a light aircraft, commencing and finishing at Prestwick Airport in Scotland. The trip will take approximately 3 months and is meant to be an enjoyable experience rather than an attempt at any speed record. 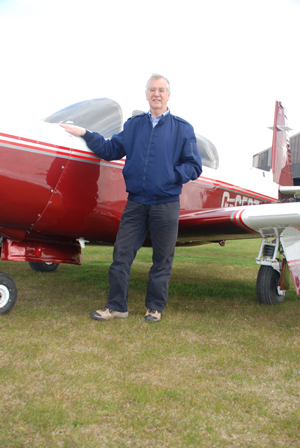 The aircraft is a Mooney 252 TSE, and the pilot is a 67-year old originally from the village of Dundonald, not too far from Prestwick Airport where he used to watch aeroplanes in his younger days. Jim will be drawing attention to two charities by means of links from this website. The two charities are the RNLI and the University of Glasgow Trust. In addition to flying, Jim also takes part in sailing activities with friends Keith, Jill, and their son Henry, and it is Henry who is most keen on the RNLI, being an avid spotter of different types of Lifeboat. Most of the sailing activities take place in the Walton and Frinton area in Essex and Henry has been on board the local Lifeboat there. The University of Glasgow Trust has many individual facets and research activities, and amongst these is the Beatson Translational Research Centre. The Beatson TRC will convert basic cancer research into real improvements in patients’ lives. It will specialise in the common tumours and those that cause the most deaths in Scotland such as endocrine (breast, prostate and ovarian); smoking related (lung, throat, oral) and gastrointestinal. Since the campaign was launched in the summer of 2007, over £2m has been pledged. The reason the campaign has been called The Beaton Pebble Appeal is because lots of small contributions will grow into something much bigger, so please donate your pebble via a donation to the University of Glasgow Trust.